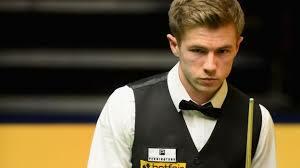 Jack Lisowski (born 25 June 1991) is an English professional snooker player. He turned professional in 2010, by finishing first in the 2009/2010 PIOS rankings. He was runner-up to Mitchell Mann in the 2007 Junior Pot Black. In the 2008/2009 season he was runner-up in the sixth event of International Open Series to Xiao Guodong, and finished 23rd in the rankings. In 2009 Lisowski was awarded the inaugural Paul Hunter Scholarship, which would allow him to practise with professional players. At the time he was suffering from cancer, and was in remission from Hodgkin's lymphoma. Overcoming his illness Lisowski competed in the PIOS for the 2009/2010 season. He won the first and eighth event of the International Open Series and finished first in the rankings and so received a place on the 2010/2011 professional Main Tour. In June 2010 Lisowski joined Romford-based snooker academy Grove Leisure. After a series of early exits from main tour events, he reached the final of Event 3 of the Players Tour Championship, winning six matches including a 4–3 win over Mark Selby in the semi-final, where he came back from 1–3 down. In the final he lost 0–4 to Tom Ford. Lisowski qualified for 2011 German Masters, 2011 Welsh Open and 2011 Players Tour Championship Grand Finals. At the end of season he climbed to 52nd in the world ranking in his first professional season, the highest of any of the debutants. Lisowski was awarded the Rookie of the Year Award at the World Snooker Annual Award Ceremony. Lisowski had a very good season in the Players Tour Championship series of tournaments in the 2011/2012 season. He reached the quarter-finals of Event 6 and Event 9 and went one better in Event 5, where he was knocked out in the last 4 against compatriot, and eventual winner, Andrew Higginson. The results ensured he finished 24th in the Order of Merit and therefore claimed the final spot for the 2012 Finals. He beat Barry Hawkins 4–3 to reach the last 16 of a ranking event for the first time in the Finals, before losing 1–4 to Neil Robertson. Lisowski also qualified for the Shanghai Masters with wins over David Grace, Mike Dunn and Marco Fu, before defeating amateur Rouzi Maimaiti in the wildcard round. He played Jamie Cope in the round and was beaten 3–5. He could only win one more match in his attempts to qualify for the remaining six ranking events and finished the season ranked world number 40. The 2012/2013 season was a breakthrough year for Lisowski as he qualified for five ranking tournaments, including the World Championship, and reached his second final as a professional. The first tournament he reached was the Australian Goldfields Open by beating Dave Harold and he lost 2–5 to Mark Davis in the first round in Bendigo. He couldn't qualify for the next two events, but then defeated Chen Zhe and Joe Perry to feature in the UK Championship for the first time. In his match against Chen, Lisowski made the first 147 in competitive play of his career. In the first round of the event in York, Lisowski lost 2–6 to Stuart Bingham. Lisowski beat Ian Burns and Jamie Burnett to qualify for the China Open and then saw off Zhou Yuelong to advance to the last 32. He played good friend Judd Trump and made a 131 break in 5–3 win, before coming back from 2–4 down to triumph 5–4 against Mark Davis and reach his first ranking event quarter-final. However, this time it was Lisowski who let a 4–2 lead slip as he lost 4–5 to Shaun Murphy, with Murphy stating that snooker had seen the future with Lisowski's performances during the week. Lisowski played in nine minor-ranking Players Tour Championship events during the season and reached the final in the first one, by seeing off Trump in the quarter-finals and Mark Williams in the semis. The final against Stephen Maguire went to a deciding frame with Lisowski missing a yellow off the spot, when requiring two further pots to leave his opponent needing snookers, and after a brief safety exchange Maguire potted the remaining colours to win the title. In the other PTC events his best results were three last 16 defeats which helped cement his place in the Finals by finishing 13th on the Order of Merit. There, he beat world number two Mark Selby 4–3 in the first round, before losing to Tom Ford in another deciding frame in the second round. In World Championship Qualifying, he had comfortable 10–4 wins over James Wattana and Fergal O'Brien to reach the Crucible for the first time, where he played Barry Hawkins. The experience and composure of Hawkins told as he took the match 10–3, with Lisowski citing the intimate nature of playing at the Crucible, which affected his concentration, as a factor in the one-sided scoreline. He climbed five place in the rankings during the season to finish it world number 35 which is his highest position to date. Lisowski began the 2013/2014 season by qualifying for the 2013 Wuxi Classic where he whitewashed Tian Pengfei 5–0 in the first round, before being narrowly beaten 5–4 by Mark Williams in the second. At the European Tour event, the Antwerp Open, Lisowski won five matches to advance to the semi-finals where he lost 4–2 to Mark Selby. He therefore entered the UK Championship in good form and looked to be progressing into the second round as he led Michael Leslie 4–0. However, Lisowski conceded six frames in a row to be beaten by the world number 94 in a performance he described as rubbish. Alan McManus beat him 5–2 in the second round of the German Masters, but Lisowski then dropped just one frame in winning two matches to reach the third round of the Welsh Open. Lisowski built a 3–1 advantage over Barry Hawkins, before last year's World Championship runner-up made a century and two breaks over 50 to eliminate him 4–3. Lisowski also qualified for the China Open, but lost 5–3 against Dominic Dale in the first round. Lisowski won three matches to qualify for the Australian Goldfields Open, but lost 5–0 in an hour to Shaun Murphy in the first round. He defeated Lu Chenwei 5–2 in the Wuxi Classic and was then knocked out 5–2 by Zhao Xintong. Lisowski won a trio of matches for the second time this season to reach the Shanghai Masters where Ding Junhui eliminated him 5–1 in the opening round. After Lisowski beat Chris Melling 6–1 at the UK Championship he said that he was hoping to rediscover his confidence after having a quiet start to the year. He also revealed that he had turned to fellow player Robert Milkins for some guidance on his game. Lisowski raced into a 4–0 lead against practice partner Liang Wenbo in the second round and hung on to progress 6–4. Following his 6–4 loss to Murphy in the third round, Lisowski said that he was still adjusting to playing in the atmosphere of major events. He was beaten 4–3 in the first round of the Welsh Open and came from 4–2 down to defeat Alan McManus 5–4 in the China Open. Lisowski lost in the last 32 of a ranking event for the fifth time this season with a 5–0 defeat to Dechawat Poomjaeng. His ranking dropped 11 spots during the year to finish it 53rd in the world. Lisowski started the season with a trio of qualifying wins for the second year in a row to reach the Australian Goldfields Open and, just like last year, he was whitewashed 5–0 in the first round this time by Judd Trump. After beating Ali Carter 6–5 at the International Championship, he lost 6–3 to Marco Fu in the second round. Lisowski knocked out Zak Surety and Graeme Dott at the UK Championship, but bemoaned the fact that he could not translate that form to the main arena in the third round as he lost 6–4 to David Grace. He was narrowly defeated 4–3 in the second round of the Welsh Open to Martin Gould. An impressive 5–1 victory over Michael White saw Lisowski progress to the second round of the China Open, where he lost 5–2 to Stephen Maguire. Lisowski was beaten 10–7 by David Gilbert in the final World Championship qualifying round. His ranking increased by 14 spots over the course of the season to end it at 39th in the world. Lisowski progressed through to the last 16 of the Northern Ireland Open by defeating David Lilley 4–3, John Astley 4–1 and Joe Perry 4–3, but was thrashed 4–0 by Barry Hawkins. At the Gibraltar Open he beat Mark King 4–2, Anthony Hamilton 4–0 and Mark Allen 4–1 (whilst making the tournament's high break of 145) to reach his second career ranking event quarter-final which he lost 4–1 to Judd Trump.